In two years, a one-of-a-kind construction project will commence over a canal in Amsterdam. It won’t involve any humans at all, but rather, a six-axis robot that can craft molten metal in mid-air. Two months later, a 24 foot-long steel pedestrian bridge will arc its way across the water. That, at least, is the plan. Leading the ambitious project is Dutch designer Joris Laarman, whose R&D company MX3D has spent the last several years reimagining what 3D printing can be—by scrapping the printer bed bit entirely. Instead, multi-axis MX3D bots can doodle drops of metal or plastic in horizontal, vertical and diagonal planes. Creating rail supports as it goes, the metal-printing bot will gradually slide forward, literally building a bridge as it crosses the canal. It’s a very cool idea, but the project is symbolic of something much larger: if successful, it could signal the beginning of a new wave of on-site, 3D printed infrastructure projects. Laarman has already demonstrated MX3D’s technology on smaller scales, using his robots to 3D print a variety of metal sculptures in his studio. But printing on site, exposed to the elements and irregular terrain, will be much more challenging than sculping in a controlled environment. With the help of engineering software company Autodesk, MX3D is developing new error control mechanisms that’ll help the bridge-building bot face all sorts of unexpected challenges. 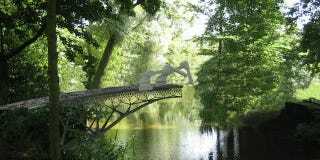 If we can 3D print a bridge on site, what’s next? Perhaps one day entire skyscrapers will be built by massive, 3D printing cranes. Even better: robots that print spaceships in orbit, using metals extracted from asteroids. Or printers that build habitats on Mars using locally sourced materials. Sure, these are lofty goals, but if we’re building robots that can be programmed to draw steel structures in mid-air, I hope we’re dreaming big.